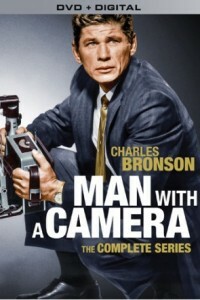 In Man With a Camera The Complete Series DVD, Charles Bronson stars as Mike Kovac, a veteran combat photographer who is now works as a New York City freelance photographer. Kovac specializes in getting those hard to capture photos that other photographers cannot take. Kovac utilizes his police contacts in learning about those cases that might bring him the perfect picture.